Click picture for blow-up These are the size that they are delivered to you (about 3" to 5" Because they ship better when they are young). From this size they will double with proper care. 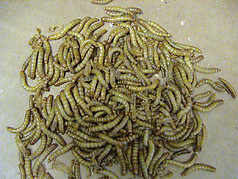 THESE ARE TRUE BELGIAN WORMS AND NOT MIXED WITH RED WORMS WHICH MANY SUPPLIERS DO TO LOWER THE PRICE. These little guys are also known as the leaf worm, dew worm, trout worm and more... Also makes a great bait worm.These are the worms that can be used in your lawn! These Large Redworms are also known as the Belgian Worms. However, we've named them EUROWORMS. These worms grow large. I have seen some at 6" to 8" and up to 3-4 grams. These are hardy worms that can take warm and cool temperatures. Euroworms can also stay packaged up to several weeks. THESE WORMS ARE SHIPPED IN A MIX OF SIZES. MOST WILL BE BEDRUN. They are excellent breeders, and you can expect them to produce 20 to 30 offspring per worm. This is the best worm I have ever seen, and is going to be big soon. The worms are shipped via USPS Priority Mail (postal service). This is an all purpose worm. You can compost with it just like the common red worm, and you can also use it for bait. This worm can be raised much the same way as the red worm. Live Worms. Great for composting. 1 LB. (approximately 250-300 worms) $47.25 Delivered via USPS Priority Mail! 2 LBS. Euroworms $78.30 Delivered via USPS Priority Mail! Place the worms into their new home. Use moist, but not wet, peat moss. Do not feed the worms for the first three days. That will allow them to eat the peat, and to acclimate to the new bedding.